IT’S BACK… Past haiku masters and new contenders will be competing for glory, fame, and a not-so-cheesy trophy in Heights Arts’ Haiku Death Match at Dobama Theatre. 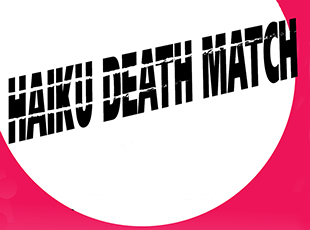 The Death Match is a live haiku poetry competition where audience votes determine the Haiku Master. Contenders, who come prepared with an arsenal of haiku, compete in pairs for a given number of rounds. The audience judges the poems by raising color paddles to indicate their vote. The emcee announces the score and keeps the crowds calm. This year’s contenders include past masters Geoff Landis and Kathleen Cerveny, recipient of the 2014 Cleveland Arts Prize; Jeff Coryell, Cleveland Heights city councilman; Cleveland Heights Poet Laureate Meredith Holmes; defending Death Match champion Ray McNeice; plus Diane Borsenik, Michael Ceraolo, Dominick Duda, Mason KuhrMary Truzillo, and Marc Zielinski. Enjoy the poetic carnage, participate as the voting horde, and help support literary arts programming in our community! Audience tickets are available online, at the Heights Arts gallery, or at the door.